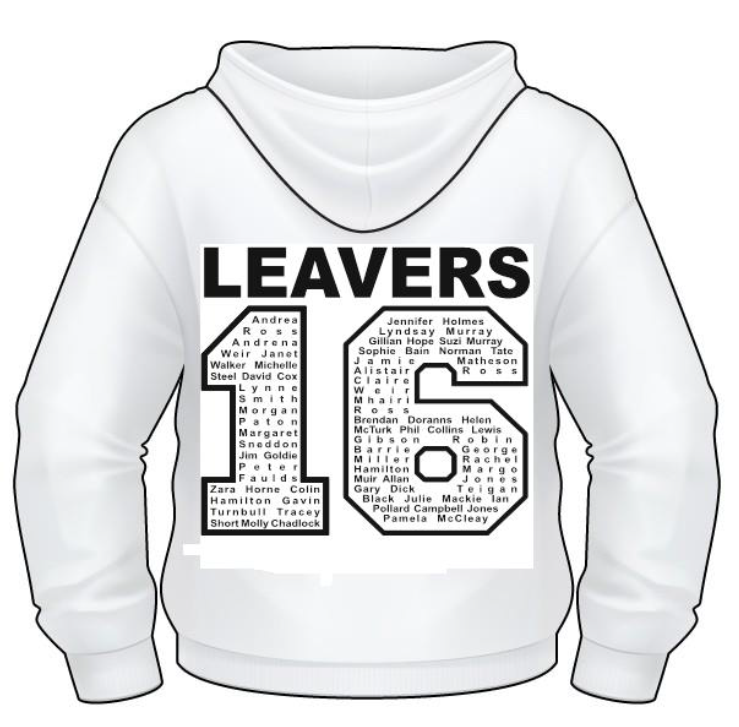 Home >> General >> Leavers Hoodies! On November 16, 2015,	Posted by balmoraladmin ,	In General,	With Comments Off on Leavers Hoodies! Are you nearing the end of your School career this year and looking for leavers hoodies to celebrate this special occasion with your classmates? At Balmoral Knitwear, we have just the thing! We can offer personalised Leavers Hoodies, Zoodies (zip-up Hoodies) in a huge range of colours with your school badge and a design with your year of leaving and the names of the pupils in your school year. We can also personalise the garments with an individual name for a small surcharge. All you have to do, is get an order and payment from your year group for at least 15 garments, which can be a mixture of any colour of Hoodies and Zoodies and get the order to us before the 22nd March 2016 and we will guarantee to deliver your garments to your school for when the exam period is finishing. We can provide you with Order Forms to make it easy. The price for adult size Hoodies is £23.95 and Zoodies are £26.95 (prices include VAT) with embroidered school badge and printed Leavers’ Design. Personalised names can be added for £2.75. Please feel free to phone or email Andrea for more details or to discuss how we can help you! Airforce Blue, Alien Green, Apple Green, Artic White, Ash, Baby Pink, Bottle Green, Burgundy, Burnt Orange, Candy Floss Pink, Charcoal, Cornflower, Cranberry, Deep Sea Blue, Denim, Desert, Fire Red, Forest Green, Gold, Hawaiian Blue, Heather Grey, Hot Chocolate, Hot Pink, Jade, Jet Black, Kelly Green, Lavender, Lime, Lipstick Pink, Magenta Magic, Moondust, Moss Green, New French Navy, Olive Green, Orange Crush, Oxford Navy, Peppermint, Pinky Purple, Plum, Purple, Red Hot Chilli, Royal Blue, Sapphire Blue, Sherbert Lemon, Sky, Spring Green, Steel Grey, Storm Grey, Sunset Red, Sunshine Yellow, Tropical Blue, True Violet, Turquoise Surf, Ultra Violet, Vanilla Milkshake. Bottle Green, Burgundy, Candy Floss Pink, Charcoal, Hot Pink, Jade, Kelly Green, Oxford Navy, Red Hot Chilli, Sapphire Blue, Sunshine Yellow also available in XS. Fire Red, Purple & Royal also available in XS & 3XL.